'Real' engineers can usually be identified by their tendency to deal with all aspects of life through a combination of pragmatism and objectivity. Every object and objective presents a challenge that requires consideration of both the initial assessment of each situation and the careful analysis of how it might be improved for personal optimization and utilization. You know the type; you probably are one of 'them' if you're reading this... one of 'us,' I probably should say. Be assured, you are among friends here. It is at the same time a blessing and a curse. Joe Cahak, owner of Sunshine Design Engineering Services, is definitely in the club as evidenced by the numerous articles he has written, and the software and devices he has created. This latest installment in his creative series offers a quantitative analysis of his new Ford C-Max Energi Hybrid horseless carriage, along with an in-depth accounting of his carefully-analyzed rationale for purchasing it and details of operational strategies. Joe also provides an update on the financials of his investment in a solar electric installation at his Southern California home. Recently I wrote about my investment into Solar power. I live in San Diego inland area and it looked like a good investment. Three months later I would like to give an update on the performance thru the winter so far. We also doubled down on the alternate energy investments and purchased a Ford C-Max Energi Hybrid to extend our energy savings. So we can take a look into that investment and hedge to future energy prices. Today's energy markets are in flux at the consumer level yet again. We are seeing rapid implementation of electric mobility to improve the energy efficiency of our vehicles. While gas prices are down a bit and more stable with the national resources coming on-line again, other fuels like propane, butane and others are much more expensive. The previous year the bills were: $204, $152 and $120 for a total of $476 and rates have increased since then. With the bad weather of sorts during the winter in Southern California was covered 82% of our electricity with the solar. This new level of service at 100-260 kWhr/month is well under 455 kWhr/month tier 1 rate at $0.15 /kWhr, instead of the higher tier 2 of $0.17 and tier 3 of $0.35 per kWhr we were regularly exceeding previously. The new charges were with the additional load of the car charging at night, which added about $15 to $20 to the bill as can be seen for the last 2 months bills. The first month the solar covered 93% of our electric use. This is performing at least as well as expected and is a huge benefit in additionally charging the car to help me commute to work and lowering my commute costs. I had to make a decision recently to replace my main commute car. My old ride was a 1999 Ford Mustang. She was a sweet ride. She had a nice sound and she rode well thru the mountain roads I take to commute to work near the coast daily. The Mustang is a 6 cylinder and gets a rated 20 mpg for the 99 model which is the 35th anniversary edition. I used the trick of putting 1 inch larger diameter tires on the back of the vehicle to improve the distance per turn ratio. This trick will cause a small loss of power, but you gain the mileage. This small power loss was not a problem with the Mustang. My Mustang was getting about 22 mpg. I commute about 39 miles each way or about 78 miles per day round trip with an elevation delta of over 1600 feet. It was costing me $40 per 3 to 4 days to refill the Mustang. This can get costly during the price gouging that sometimes goes on in Southern California. Now I had to get a new car to commute with. I didn't have to dump the Mustang. I build a low height storage shed and am parking it. I plan to keep it and work it up some to keep as a classic. The car I selected was one I had my eye on for a while. Being a Ford customer with the Mustang and liking the car and reputation of the manufacturer were factors. I really liked the fact that Ford didn't have to take Government money to survive. I also liked the plug-in hybrid idea. I was out to save money in the long haul and become more energy and expense efficient. 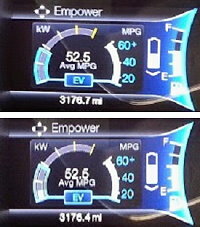 The C-Max Hybrid has a base gas mileage of 44 mpg. It has about 200 horsepower. It also has a 7.6 kWhr battery capacity to store about 20 miles. I get about 5 to 8 miles less on cold and dark winter mornings. The more accessories I have to use, the less electric range I get first portion of the car trip before it switches over to hybrid mode. My neighbor bought a Plug-In Prius Hybrid and his package cost was $47,000. I felt this was very high. 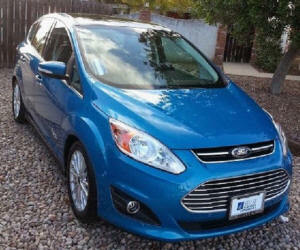 The cost of the C-Max was about $38,000 with several options and the paint color I wanted sapphire blue. I also got a $3000 year end close out discount with a California rebate of $1900 and a Federal Tax credit of about $2300. This purchase had to be made before Jan. 1st to get the tax credits and rebate. This gave me an out the door price about $31,000. I had good credit so I got a 0% loan and only put money down to reduce the monthly payment. I didn't have any cost to not use my money for the purchase. The car started with about 46 mpg and has been gaining about ½ mpg per week. I am presently at 52 mpg cumulative and it is still climbing as the Ford manual said it would. The trip readout shows the last two trips, so you can review to and from work travel statistics and see the difference. In my case, the mainly downhill to work requires 0.2 to 0.3 gallons for 39 miles or about 100 to 148 mpg. The mainly uphill trip home is 0.7 to 0.8 gallons or about 35-40 mpg depending on how fast I go on the hills. At 50 MPH, I don't lose as much mileage as I do at 55 or 60 MPH. I merely have to back off on the speed a bit to make substantial gains in efficiency. I do the polite driver thing and move to the right lane for my faster compatriots on the road to pass me by. Cold and dark winter mornings require the headlights and heat, so I get much less electric range. At a gas price of $3.75/gallon and I drive about 78 miles per day, 390 miles/week and 1800 miles/month. The Mustang it was costing me $307/month and the C-Max is costing me $140 combined gas and electric with about $100/month for the gas and $40 electric charge. So, I use 42% less energy to commute than I did previously. With the electric being supplied by the solar system I put in, my actual out of pocket cost to commute to work dropped from $300 to $100 or about 2/3. $200/month is $1200 per year in energy savings over my Mustang. Driving on the surface streets down the hill, if I keep speed up at 50-55 mph I am always using gas. I found that doing a short ramp up to speed and then backing off and just maintain speed, the car will go back into electric mode and use much more of the charge available, instead of switching to gas engine. I call this stretching the charge. Driving this car is different in that you ride the brakes, unlike a normal car, it would wear out the breaks. In this car there is a hydraulic drive and I found that a small depression on the break as I gain speed downhill, gives me a nice boost in charge while keeping the speed down. Also I get breaking reports from the car to tell me how well I braked to regain the energy showing the percentage of energy recovered when I break for stop lights, traffic or lame/dangerous drivers. I love being able to sail thru the commuter lanes on my uphill stop and climb to the Highway. Use to take me 2 to 5 minutes. I sail right thru most days now in under 30 seconds. Another feature is the car in auto mode senses regular destinations from the GPS and will not run the gas engine to recharge the battery so close to home. This setting is 1/8 mile or 200 meters. This is too short a distance for me. Using the battery charge stretching method, described for the surface streets, comes in very useful here to help me extend that in practical usage to 4-5 miles or more if I carefully use my breaking recovery and mpg stretching on the last distance to home. Our round trips to the local downtown is all electric and only cost about $1.00 in electric charge, instead of the previous ~1 gallon of gas or about $3.75 for the round trip to town. Another feature of the new cars is the media and environmental integration into the car. The sound has AM, FM, DC, Sirius XM, and USB Digital. It also has Bluetooth to the phone and will play the phone playlist as well as connect thru the phone for hands free phone operation. I still don't talk much while driving. The AM isn't much good here due to the Sierra and Colorado Ranges radio shadowing Southern California. So, I can't listen to those old Midwest favorites WLS and KAAY. Now it's 60s on 6, 70s or 7 or some Smooth jazz stations on Sirius XM. All the FM oldies and smooth jazz stations are a thing of the past. Now it's all bee-bop, hard rock, and south of the border or country western. It's a radio wasteland. The environmental system has individual temperature control and heated seat for those cold mornings. My wife definitely likes those seats and they are very comfortable to ride in. There is a large sunroof with a roll out shade built in. OK, I am a sun worshipper after growing up for 30 years in Northern Wisconsin and not seeing the sun for months at a time. The front windshield is wide and deep for a very good view. Performance of the car is good. It has the electric zip at the start line and can have a fair push if you stomp the pedal to the floor. I drive slower and come to speed and level off and use the efficiencies of the car to some extent but am not ruled by it. There is a lot to learn about the car and the features available. For instance you can program the car to start and warm up for you among other goodies like auto parking. We have it, but I don't use it. The feature was an option I didn't really want. Overall, I am satisfied with the car and pleased with the ride and the performance. Although I think my friend Kirt is jealous - he keeps joking he saw my car in the toy store - I don't mind. The savings is real and I have a sweet and comfortable ride to and from work.